The Mavericks Challenge California surf contest gives the world's best surfers a chance to test their skills against monster waves that can rise as much as 60 feet high. It all sounds simple enough, but this contest has an interesting twist. It doesn't have a fixed date. In fact, no one knows precisely when it will be held until just 24 hours before it starts. The big waves at Mavericks near Half Moon Bay, California that are the reason for this contest of big wave surfing control the calendar. Just off a rugged, rocky point along the coast, winter storms and underwater geography combine to create some the biggest and most dangerous waves in the world. Most of the year, the ocean's waves look perfectly ordinary at Mavericks. The big waves come only after a big winter storm in the Pacific Ocean. No one knows in advance when the waves will peak, or even if they will get to their legendary sizes at all. In fact, in some years they never get big enough to hold the surfing contest. The last time that happened was the 2017-18 season when the big waves never materialized, which was unfortunate because it would have featured the first-ever women's competition at Mavericks. Late each year, contest organizers announce the official waiting period for the Mavericks surf contest. This year, the competition window opens on November 1. When conditions look like they are going to be right, the organizers call a group of pre-selected surfers to let them know when the Mavericks Challenge will begin. The contestants have just 48 hours to get there. That's all the time you'll have to prepare to watch them, too. The first Mavericks surf contest was held in 1999. The name and the group running it has changed every few years. In fact, Mavericks may be one of the unluckiest events in the entire surfing world, with a long tale of things gone wrong. The World Surf League whos was its sponsor in 2017-18 renamed it the Mavericks Challenge. They held an opening ceremony for the 2018-2019 contest in October 2018. No matter what the name of the competition is or who's running it, if Mother Nature provides the waves, tens of thousands of spectators sometimes gather to watch that elite group of the world's best big wave surfers. If you want to watch the Mavericks Challenge, you need to know when it's going to happen and by now you know you won't have much time to get ready. No details for viewing were posted when this was written, but you can check the World Surf League website for updates where Mavericks is listed under Events as the Men's Big Wave Tour and Women's Big Wave Tour. 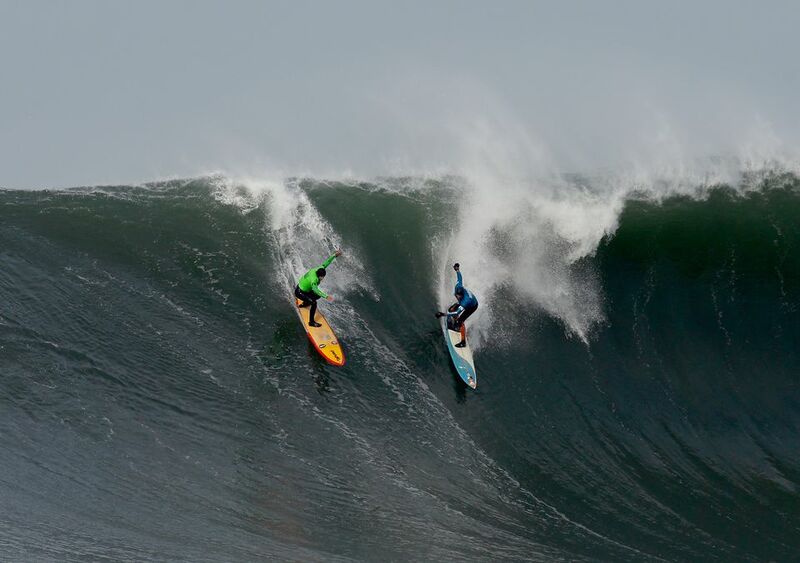 The Mavericks Challenge's heart-stopping, big waves break over an ocean reef off Pillar Point near Half Moon Bay. If you decide to go to Half Moon Bay to see what's going on, don't expect to see too much from land. The big waves break about half a mile offshore. Bring binoculars and arrive as early as you can to find a good viewing spot. During the Mavericks contest, previous event organizers set up shuttles from parking lots at the airport or harbor. They also offered a chance to go out in a boat to see the action up close, but that may or may not happen this year. You might get a much closer look at the surfers if you watch online than if you go to Half Moon Bay to try to see it. You can also find that on the World Surf League website. During the off-season, it's easy to get a look at the Mavericks location. In the winter, you may see some of those spectacular waves, but the rest of the year, it's more of an ordinary ocean scene. You can get to the coast on CA Hwy 92 or by taking CA Hwy 1 south from San Francisco or north from Santa Cruz. From CA Hwy 1, take the South Capistrano Rd exit near the Half Moon Bay Airport. Follow the road past the harbor entrance. Turn left on Prospect Way and west onto Harvard Avenue. After it merges with West Point Avenue, follow the road up the hill to the Pillar Point Marsh lot and hike about one mile uphill, along the sandy footpath to the viewing area on the bluffs.